I can't believe how cold it is, we had snow today...beginning to think spring is never going to arrive. Here is a card I made using a stamp which I bought from a charity shop. The stamp is square with a flower pattern on the left, writing on the right and two dragon flies. I stamped onto white card and coloured in the flowers on the left, and the dragon flies. 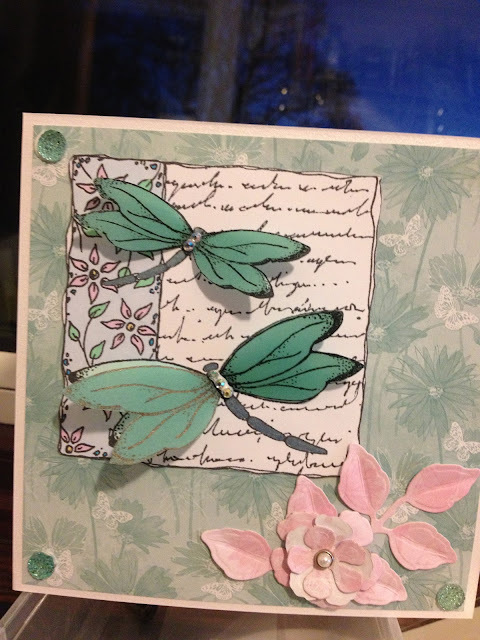 I then stamp onto green velum and cut out the dragon flies wings, I glued just the centre part of the wings into place and once dry I bent up the wings to give the card movement. I glued some gems in the middle of the wings, which hide the glue but also looks good for the body of the dragon fly. I mounted it onto some patterned paper I had and placed four gem stones at the four corners. I also cut out some pink flowers and leaves to match the flowers, which I had coloured in.